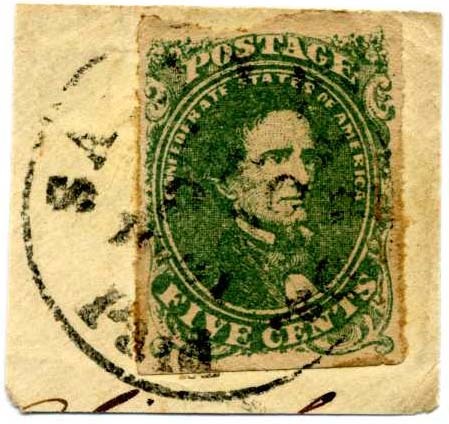 CSA 1, 5¢ green Stone 1 Position 38, tiny pinhole, rare straightline grid cancel not listed in Conrad Bush book on same, SCV for regular used stamp $325. $300. 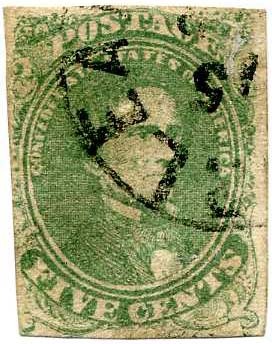 CSA 1, 5¢ green, full original gum, vertical gum crease breaking to small thin, SCV $300. 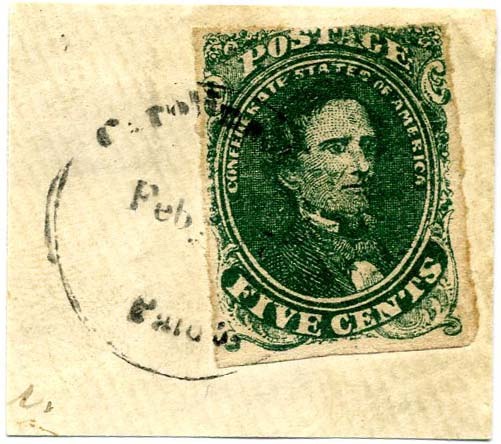 CSA 1, 5¢ green tied MADISON / Ga. // FEB/24 (1862) cds on small piece, 4 nice margins, SCV $175. 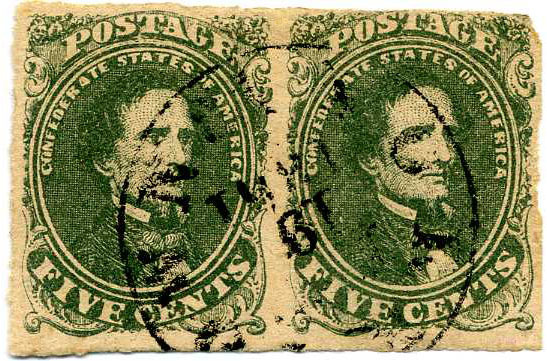 CSA 1c, 5¢ olive green, (not plated but likely Stone A-B) pair used with early YORKTOWN 1861 cds, right stamp with light crease and edge fraying, SCV $450. 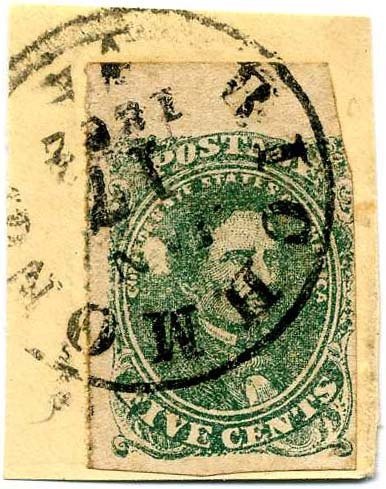 CSA 1, 5¢ green, lightly canceled, four even margins all around, small faults, $110. 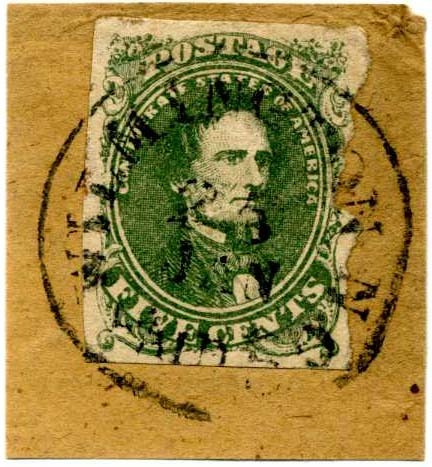 CSA 1, 5¢ green used with GEORGE(TOWN / S.C.) FEB / 24 cds, small thin $150. 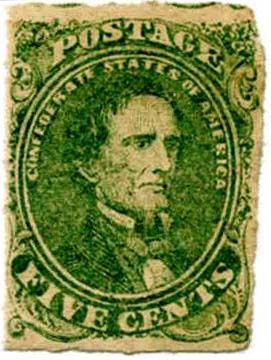 CSA 1, 5¢ green, unused with full original gum, tiny thin at right edge, 2019 SCV $300. $150. 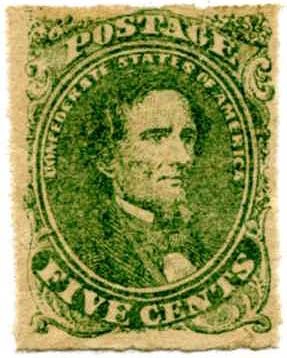 CSA 1, 5¢ green, unused with full original gum, tiny tear at top, very lightly hinged, 2019 $300. $140. 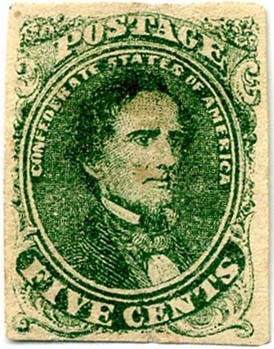 CSA 1, 5¢ green used with indistinct Virginia cancel, light diagonal crease, well centered and attractive, $150. 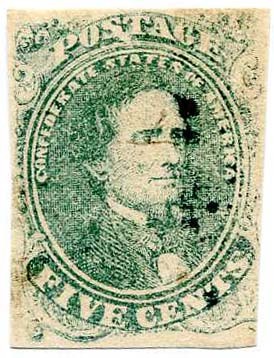 CSA 1, 5¢ green right sheet margin, Stone 1 tied neat bold MOBILE / ALA // FEB / 20 / 1862 dc on small piece, Fine. $180. CSA 1c, 5¢ olive green tied on piece by WILMINGTON N.C. / PAID 5 // 23 / JAN  cds paid made from altered pre-war 3¢ handstamp, Pretty. $200. 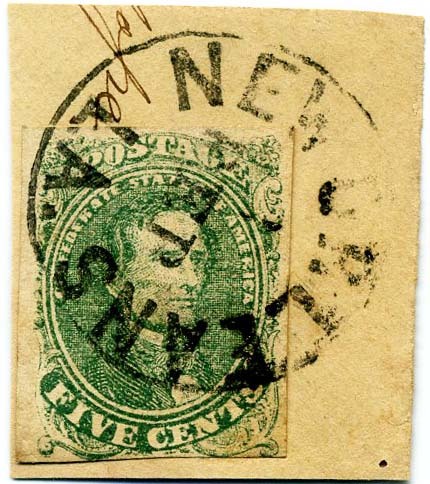 CSA 1, 5¢ bright green tied on piece by neat blue PORTSMOUTH / VA // JAN 1 / 1862 double circle cancel, Pretty. $200. 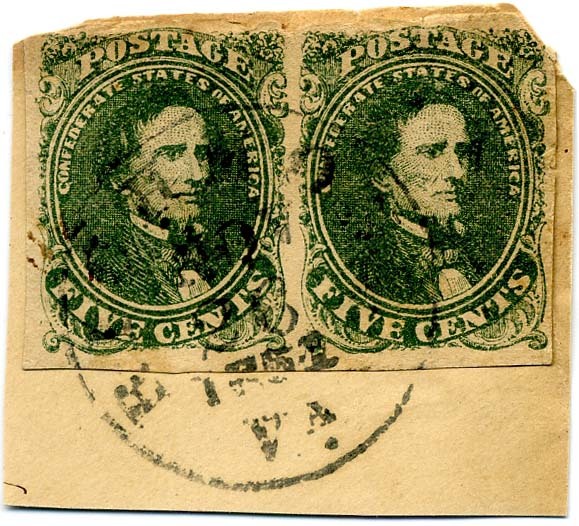 CSA 1, 5¢ green pair tied RICHMOND / Va. // OCT / 22 / 1861 cds – first month cancel. Not plated yet, but scarce early pair used on piece so either Stone 1 or Stone AB, Stone 1 SCV $515+. $450. 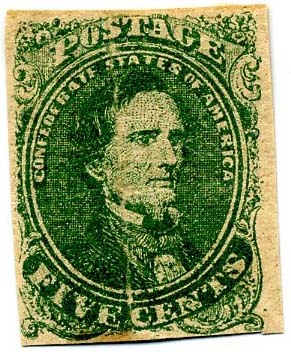 CSA 1, 5¢ green tied on piece by neat SAVANNAH Ga. / PAID // DEC / 22 / 1861 cancel, SCV $175. $110. 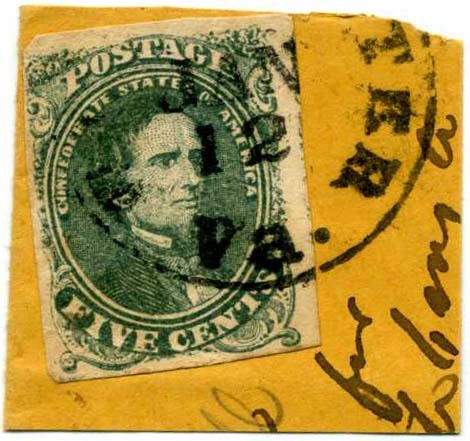 CSA 1, 5¢ green tied RICHMOND / Va. // MAY / 31 / 1862 cds on piece, SCV $175. $130. 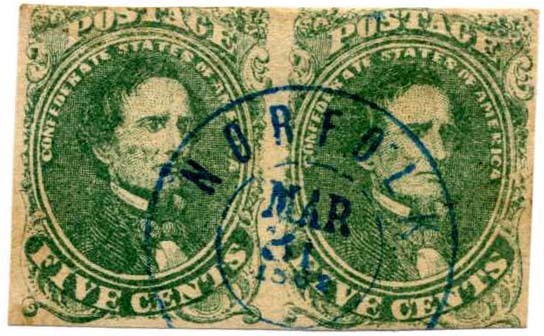 CSA 1, 5¢ green pair beautifully canceled with blue NORFOLK / VA // MAR / 31 / 1862 double circle, tiny thin in right stamp, SCV $435. $300. 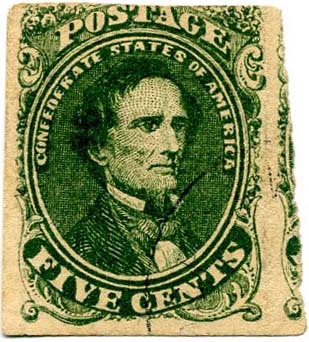 CSA 1, 5¢ green tied neat RICHMOND / Va. // NOV / 26 / 1861 cds on piece, Early use, SCV $175. $110. 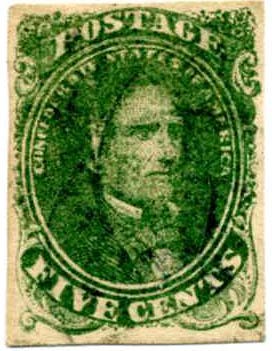 CSA 1, 5¢ green block of four, full original gum, faintest negligible gum creases, very lightly hinged, Fine-Very Fine, SCV $1,750.+ $450. 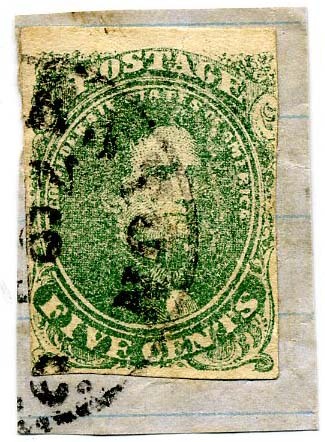 CSA 1, 5¢ green tied WINCHESTER / Va. // JAN / 12  cds on small piece, corner crease at lower left, SCV $175. $110. 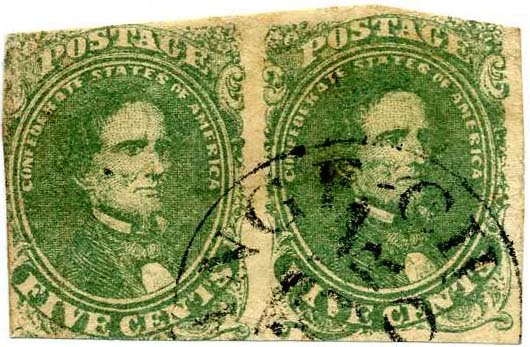 CSA 1, 5¢ green used pair with neat bold ACCOKEEK [Va.] // FEB / 27 / 1862 cds, SCV $425. $300. 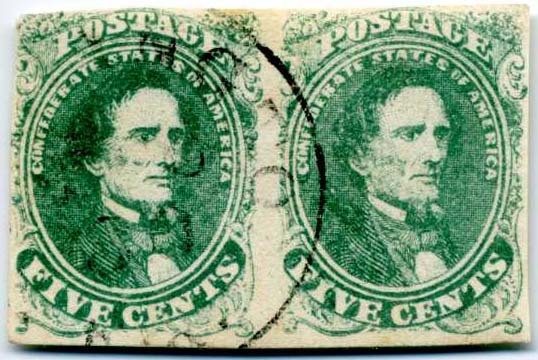 CSA 1, 5¢ green pair with 80% original gum, thin otherwise Very Fine, lovely fresh pair, SCV $600. $300. 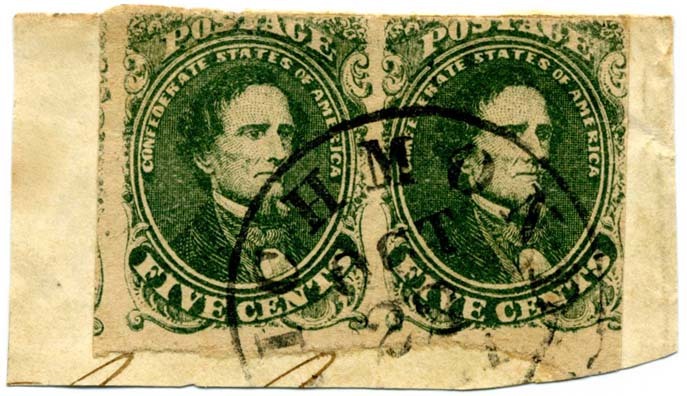 CSA 1, 5¢ green pair, used with light circular date stamp, SCV $425. $350. 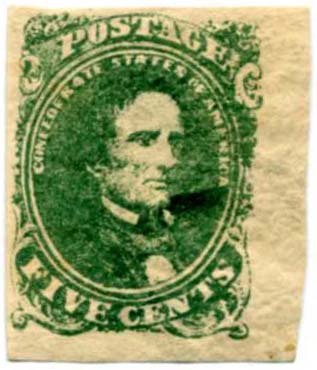 CSA 1, 5¢ bright green used, tiniest pinhole, SCV $175. $130. 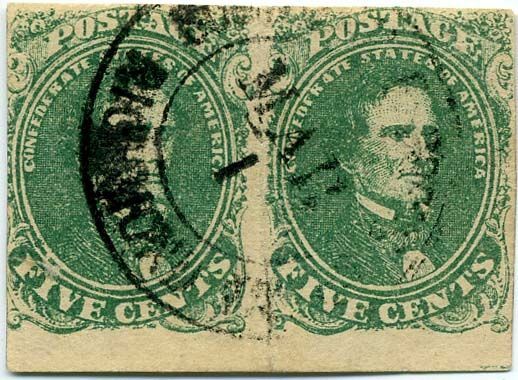 CSA 1, 5¢ green, full original gum, horizontal crease across top, SCV $300. $160. 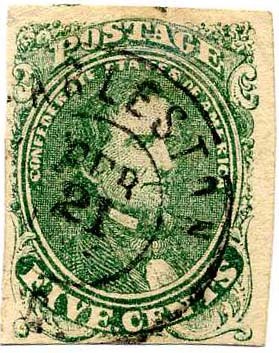 CSA 1, 5¢ green, tied on small irregular piece with blue Covington Ga circular date stamp, SCV $175. $125. 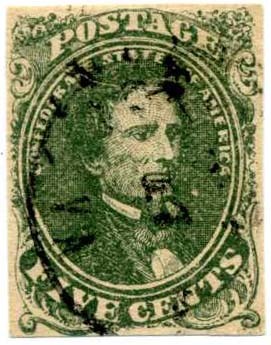 CSA 1, 5¢ green with lightened pen cancel, washed out. $50. 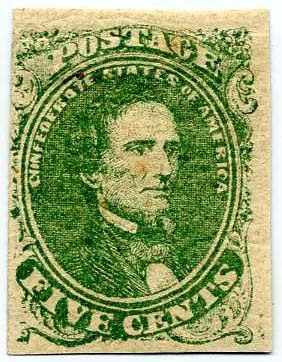 CSA 1, 5¢ green Stone 1 as noted on verso (not verified by me), used with neat circular date stamp, SCV $200. $150. 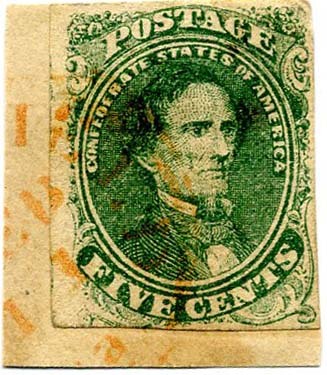 CSA 1, 5¢ green used with neat circular date stamp, SCV $175. $125. 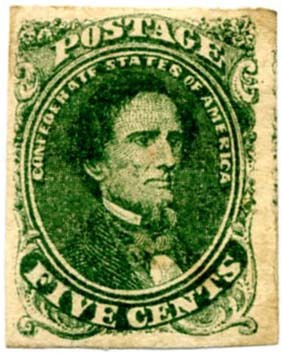 CSA 1, 5¢ green, tied on small piece with double strike of bold New Orleans, La. 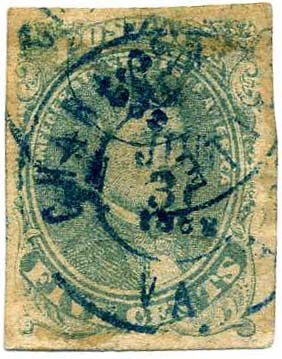 circular date stamp, SCV $175. $150. 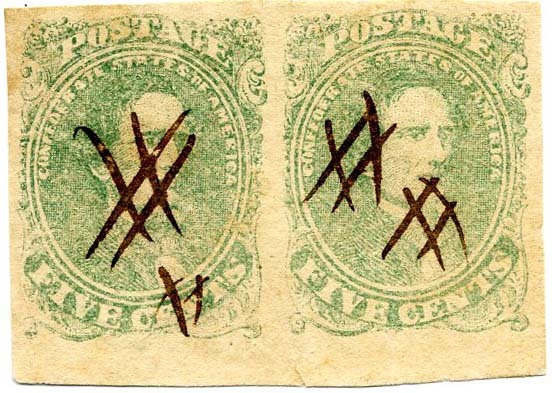 CSA 1, 5¢ green pair used with neat Orange C. H., Va. circular date stamp, SCV $425. $200. 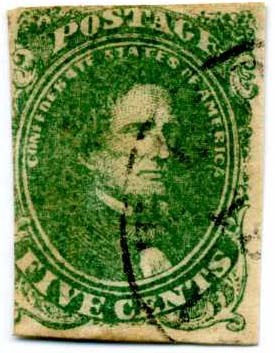 CSA 1, 5¢ bright green with colorless line under ST of STATES, used with blue grid, couple creases. $200. 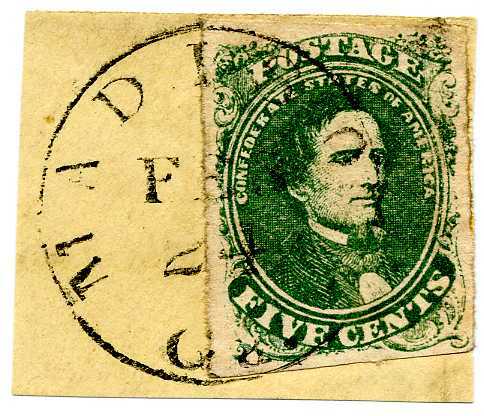 CSA 1-1, 5¢ green Stone 1, position 50 used with neat CHARLESTON / S.C. // FEB / 21 double circle cancel, small faults, Very Fine appearance, SCV $200. $100. 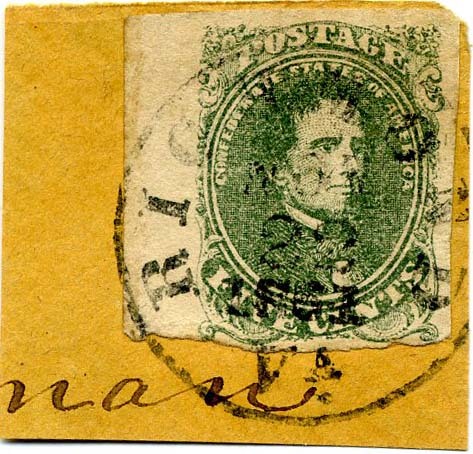 CSA 1-1, 5¢ green used with two blue double circle postmarks of different dates just before the rate change to 10¢ - CHARLOTTESVILLE / VA // JUN 29 and another JUN 30, 1862, small faults, part of album page adhering to back, 2005 CSA Certificate 04693. $150. 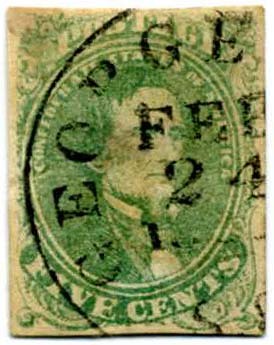 CSA 1, 5¢ green used on piece with two blue cancels of HILLSBORO and RALEIGH [NC] as well as blue grid, SCV $185+ $120. 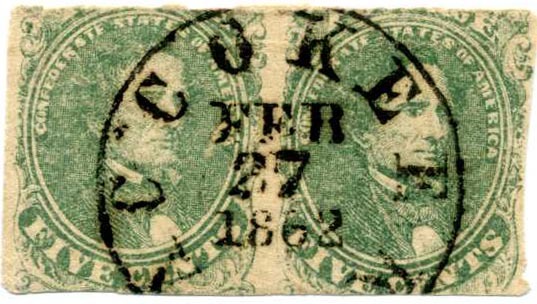 CSA 1, 5¢ green pair tied on small piece by neat RICHMOND / VḀ // NOV / 26 / 1861 cds, small faults at top, SCV $425. $200. 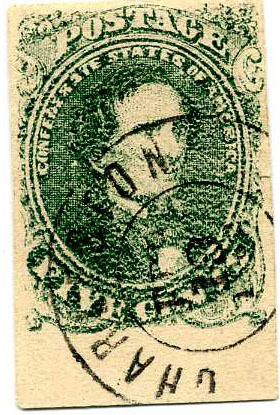 CSA 1, 5¢ Green, Stone 1, positions 47-48, horizontal pair with bottom sheet margin, neat strike of SOUTHERN EXPRESS CO. / RICHMOND VA. // MAR. 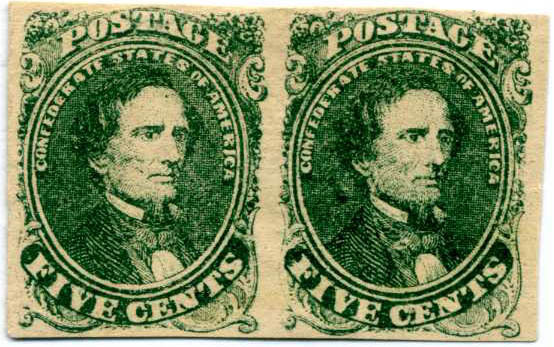 1 double-circle datestamp, vertical crease between stamps and closed tear at left neither of which is noted on accompanying 1972 PF Certificate, Fine appearance, Very scarce cancel, Ex Powell. $500. 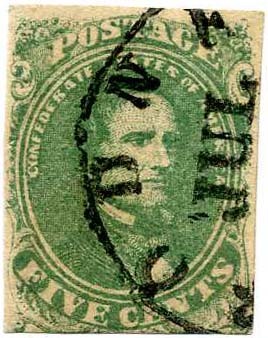 CSA 1-1, 5¢ green, Stone 1, used, faint pressed crease otherwise Very Fine, Ex Wishnietsky. $125. 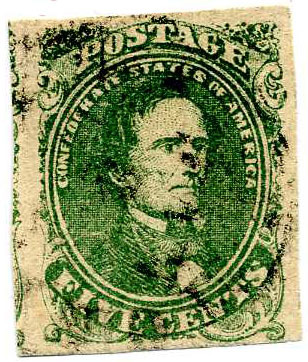 CSA 1, 5¢ green, fresh, rich color, nice used example, close to being a Pop Eye variety but should have white completely surrounding it to be so classified - none the less distinctive. 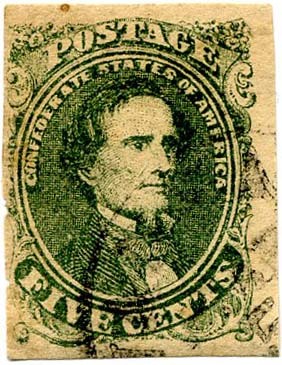 SCV $175. $140. 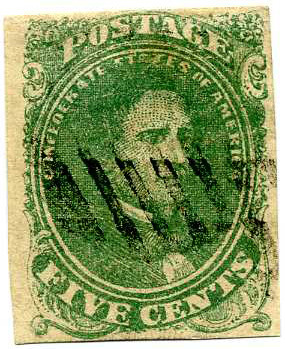 CSA 1, 5¢ green, used with unidentified town cancel – almost FACE FREE CANCEL, nice impression, couple tiny nicks in left margin. $120. 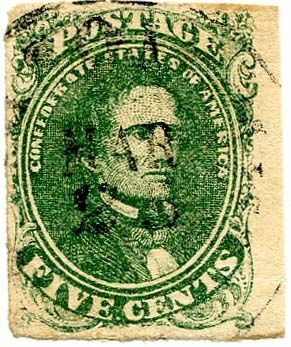 CSA 1, 5¢ green, 4 margins, part original gum, thinned, gum staining, Very Fine appearance. 2019 $300. $150. 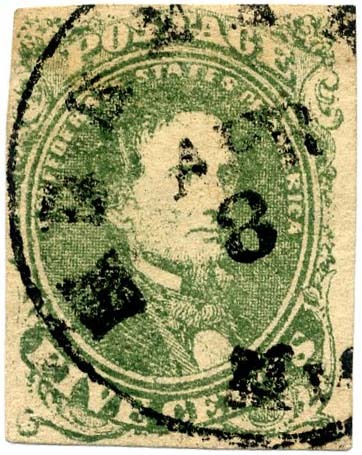 CSA 1, 5¢ green, used with unidentified town cancel, part of which is Y SPRINGS / MAR (Holly Springs, Miss), ample to huge margins, bit of gum staining, Very Fine, Ex Cox. $125. 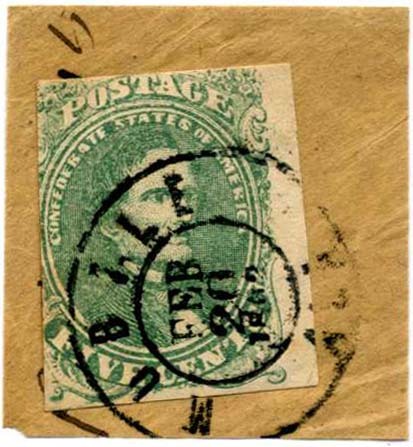 CSA 1a, 5¢ light green bottom sheet margin pair used with manuscript cancels, small tear at bottom margin, Ex Cox. $200. 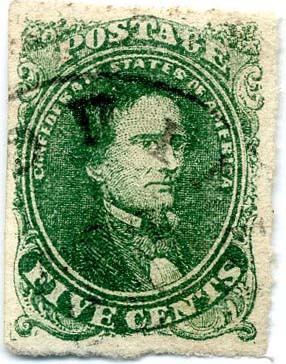 CSA 1, 5¢ green, unused, faulty space filler. 2019 SCV $300. $90. 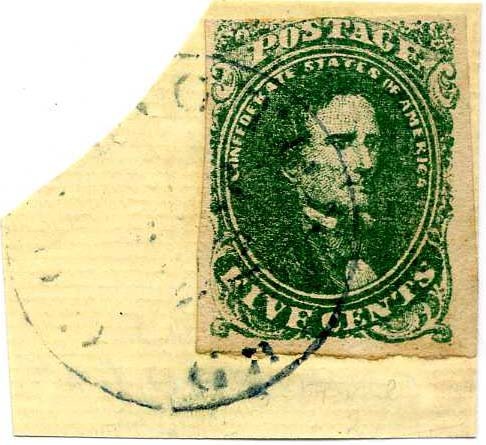 CSA 1-1, 5¢ green left sheet margin copy, Stone 1, tied on piece by RICHMOND / VA. // NOV / 22 / 1861 cds , SCV $200. $220. 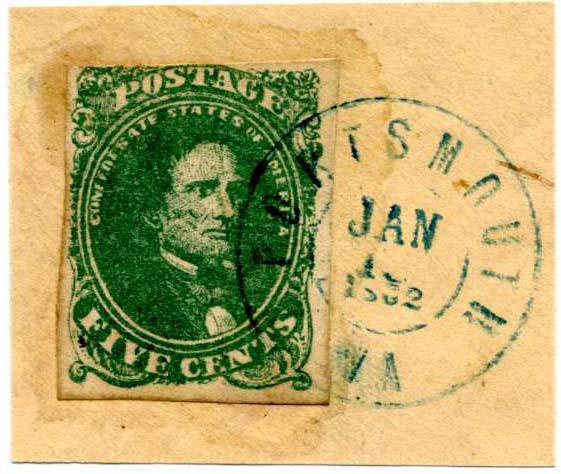 CSA 1, 5¢ green, touching at top to huge margin showing part of adjacent stamp at right, faulty, FACE FREE postmark. Great looking. $85. 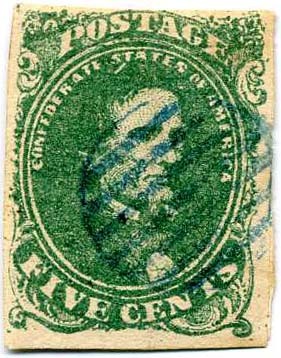 CSA 1, 5¢ green, tied on small piece by ORANGE SMITHFIELD / Va. Feb 11 CDS, UNLISTED IN ORANGE in Scott but well known, Rare, Ex-Hall 1925 sale by C.J. Phillips. 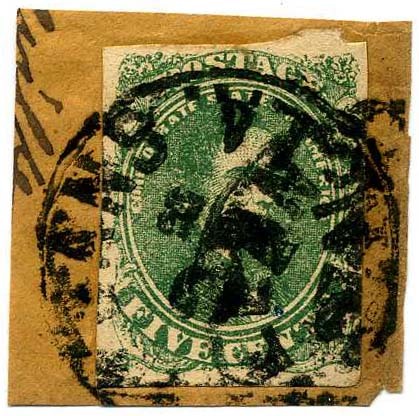 Scuff caused by hinge pull on back of piece creates the illusion of a stamp thin, but stamp is sound, 2008 CSA Certificate 05249. $425. 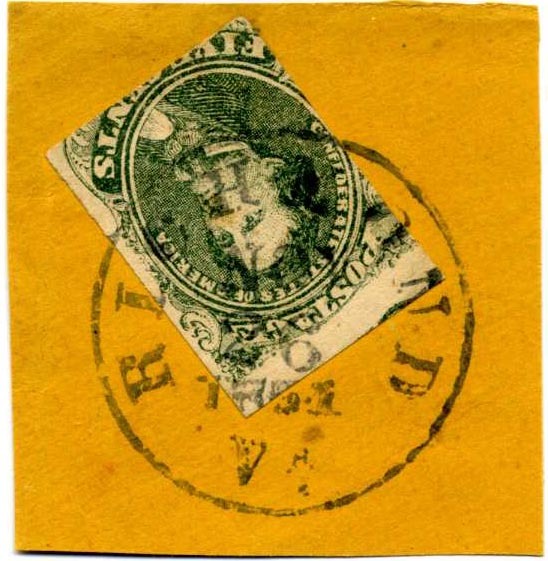 CSA 1-2, Stone 2, LL position 46, 5¢ green, 4 large margins all around, used with neat cds, backstamp guarantee of Georg Bühler, slight bend at upper right corner otherwise Extremely Fine, SCV $175. $150. 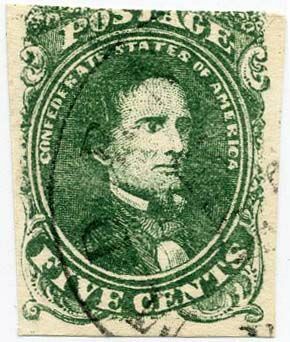 CSA 1, 5¢ green tied on piece by NEW ORLEANS / LA. // 3 / FEB cds, Very Fine, SCV $200. $180. 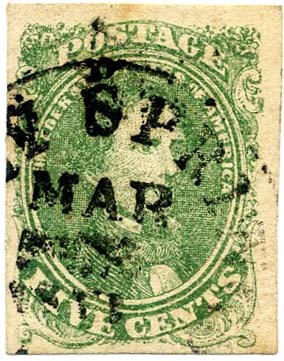 CSA 1, 5¢ bright green tied on small piece by bold CORINTH / Miss. 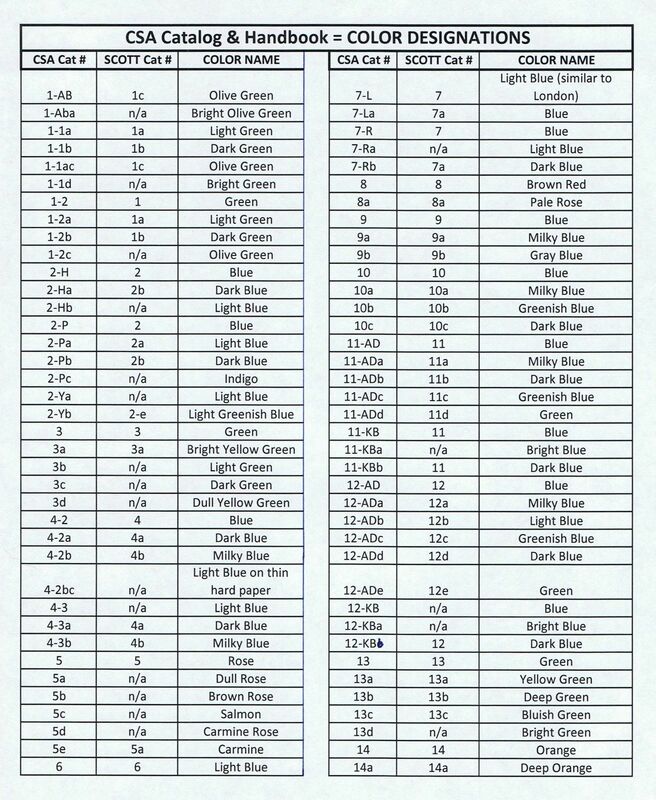 // FEB / 21 double-rim circle postmark, vertical pre-use crease, SCV $200+ $100. 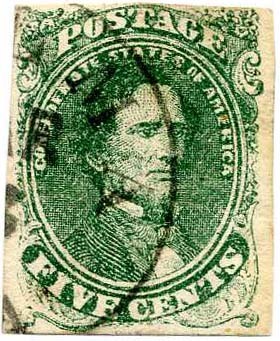 CSA 1, 5¢ green, unused, 4 margins, fresh, nice color, faint internal creases, Very Fine appearance, 2019 SCV $300. $150. 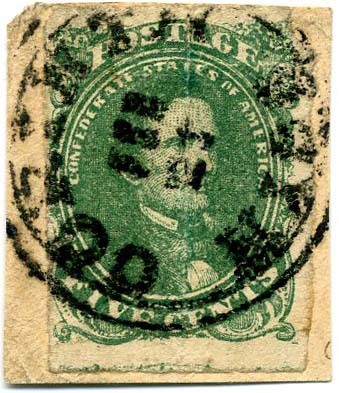 CSA 1, 5¢ green lower right sheet margin copy, old note on hinge remnant saying “white shirt” variety, but has traces of green in the shirt which eliminates that to my mind, most of original gum, heavy hinge remnants, heavy natural green printing ink swipe. $220. 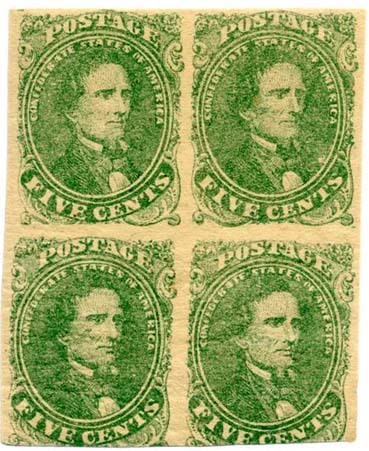 CSA 1, 5¢ green used with neat town cds, 4 margins, SCV $75. $120. 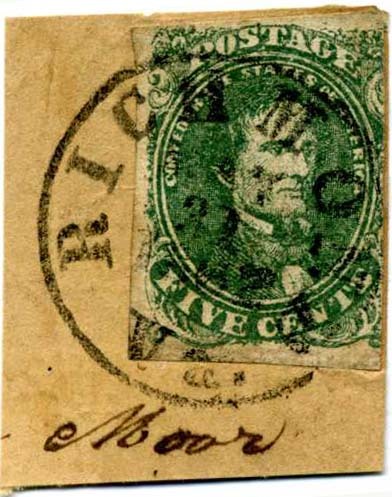 CSA 1-1-v7, 5¢ green Stone 1 top sheet margin with CSA Catalog listed dramatic transient white spot, tied on piece with neat clear RICHMOND / Va. // Jun / 17 / 1862 cds, CCV $325. $300.